A ghoulishly simple, made-from-scratch cheesy breadstick loaded with pesto sauce and mozzarella cheese. In a medium bowl, stir together water, yeast and sugar until dissolved. Stir in mozzarella, ¼ cup pesto and salt. Mix in flour until a dough forms. Turn dough out onto a floured surface. Knead for 2-3 minutes adding flour as needed. Place in a bowl, cover in plastic wrap and rise for 20 minutes in a warm place. Tear off 1-inch pieces of dough and roll into skinny, finger-length shapes. Place on a parchment lined baking sheet 1-inch apart. Brush with remaining ¼ cup pesto. Bake for 10 to 12 minutes, until lightly browned. Remove from oven and cool to room temperature. 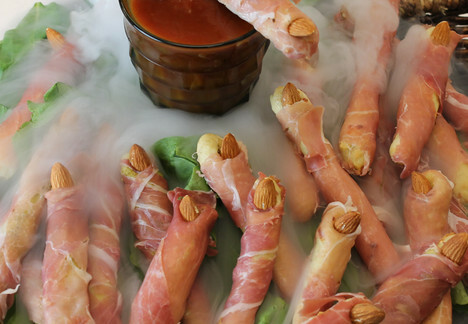 Wrap each finger with slices of prosciutto and insert an almond into the top to look like a fingernails. Serve immediately with marinara sauce on the side.